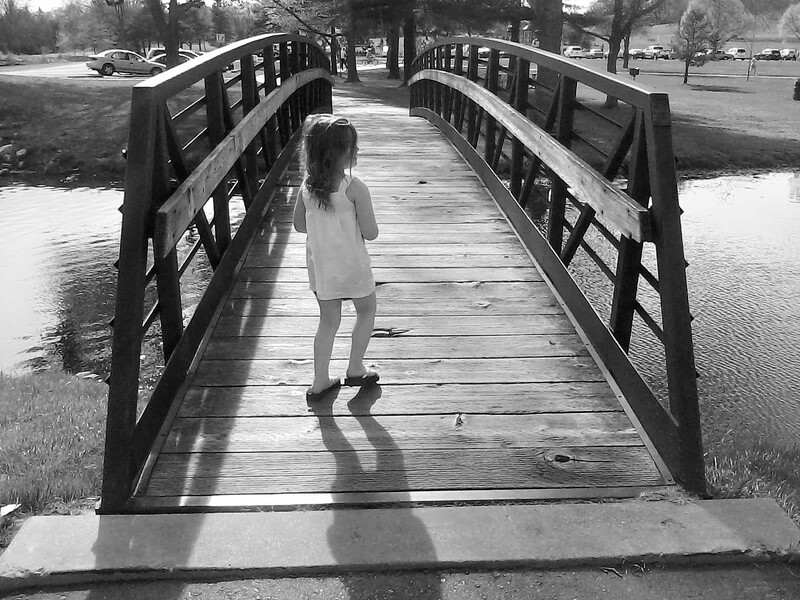 A girl walks onto the bridge over Cascades pond in this early May 2014 photo. The innocence of youth is bliss, as is clearly being shown in this picture of a young girl gazing out over this bridge over untroubled waters. This shot was captured quite unexpectedly; I was just going to photograph the bridge simply and have a pleasant nature shot but then enters this child in front of my view. The creative side of me instantly showed a great opportunity to make an even better shot. Anytime there is a subject in one of my pictures, whether young or old, a message can be formed and deeper meanings can be accessed. She had no idea she was photographed; I don’t believe I was being a sort of creep while taking this, I just saw the perfect opportunity and ran home with it. I believe I heard her mother calling after her to come back or be careful. Someday this child will grow up, go on to do whatever is destined in her life, and might stumble across this photo one day and say “Hey, that’s me, but who took that picture?” She will never know it was me and that is the blissful innocence on both sides of the lens. Though her mother might still remember, in her old age, might remember seeing a young man in black snapping a picture with a small camera as the girl stepped onto the bridge and then going back to his daily life. I never saw the mother, only the girl who formed the Bridge of Youth and Innocence. Beautiful shot and a wonderful writeup!